Owen Ashley, South African motorsport engineer and car builder extraordinaire, who was also a former chairman of the WPMC Killarney Board of Directors, passed away on the 16th of March 2010. Owen matriculated at Rondebosch Boys High School and was already passionate about motor sport, he was only 19 when he completed the construction of his first competition vehicle. He went on to design and build 170 different types of racing and road vehicles for, amongst others, BMW (SA), General Motors (SA), and Toyota (SA). His construction total is over 450 vehicles. Approached by Toyota South Africa in 1981 to fill the position of motorsport manager, one of his first tasks there was the development of a four-wheel drive rally car. Once completed, it proved so successful that it went on to win numerous South African rallies against the likes of the works Audi, Nissans, and Volkswagens of the time. Toyota Team Europe were so impressed that they adopted the gearbox and transmission design and went on to win the World Rally Championships four out of seven years running. On leaving Toyota, Owen was put in charge of technical aspects of all motorsport in South Africa for SA Motorsport Control, managing the technical rules enforcement, for the sport. His next move was to form his own company, Owen Ashley Auto Developments, in Cape Town during the late 1980’s. His object was to design and manufacture specialised one-off and low volume vehicles, as well as to consult for various other motor sport related companies. These included Cape Advanced Vehicles (CAV), where he was soon appointed managing director. Under his control, CAV exported 100 road-certified GT40’s to the US over the following years and has built in excess of 150 vehicles to date. Owen also joined Optimal Energy as consultant in 2006 to assist with their research and development of a South African electric car called “Joule”. He designed and built the one-make Supercar Series, that is still operating successfully after more than 14 years. He was a source of inspiration and advice to many young drivers. His contribution to local and national motor sport was immeasurable. 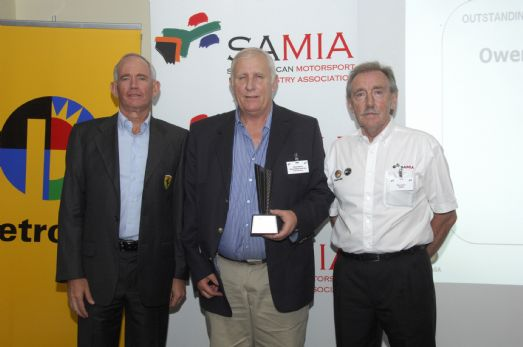 In 2009 Owen received the “Lifetime Achievement Award” from Motorsport South Africa. He also received the Award for “Outstanding Motorsport Engineering Achievement” from the South African Motorsport Industry Association.